Seth Rollins openly admitted that Dean Ambrose all but made it possible for The Kingslayer to win the Intercontinental Title from Dolph Ziggler at SummerSlam by taking out Drew McIntyre. On Raw, Rollins returned the favor, running interference at the moment of truth to help Ambrose over the finish line against Ziggler in The Lunatic Fringe’s first match following a nine-month layoff due to injury. It seemed, however, like McIntyre would be the one to claim retribution, as the former NXT Champion stalked a weakened Ambrose at ringside, prompting Rollins to step up. The Architect was briefly overwhelmed by a two-on-one attack from Ziggler & McIntyre, but Ambrose broke it up and sent the action back into the ring. Rollins quickly rallied to down McIntyre with a suicide dive, and Ambrose did the rest, putting his new, power-based style to good use by stopping Ziggler’s leaping DDT cold, popping him into the air and catching him in Dirty Deeds for the win. Roman Reigns defeated Finn Bálor one-on-one to retain the Universal Championship in a title match two years in the making, but when it came to repelling Braun Strowman and his Money in the Bank contract, the Universal Champion needed a little help from his friends. Before Strowman showed up and all hell broke loose, however, Reigns and Bálor put on an instant classic where The Extraordinary Man summoned the full reserves of his legendary heart. Reigns, unfortunately, had reached his proverbial final form and took everything Bálor had to give him. The arrival of Strowman allowed Finn to set up the Coup de Grâce, but Reigns avoided the move and spiked the Irishman with a thunderous Spear for three. 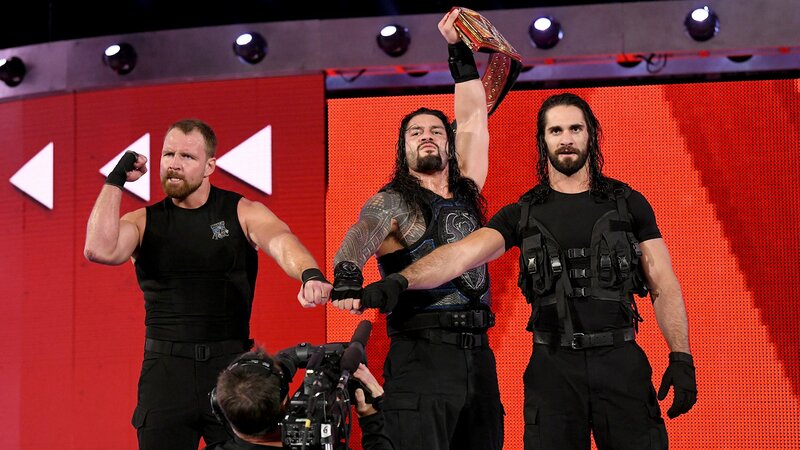 Strowman quickly entered the ring and struck down the reeling Reigns with a vicious kick, but his Monster in the Bank cash-in was cut short by the unmistakable crackle of “Sierra, Hotel, India” and the arrival of Dean Ambrose and Seth Rollins, back in the signature black colors of The Shield. Strowman didn’t hesitate to throw down with the brothers in black, but The Hounds of Justice overwhelmed him all the same after Reigns Speared Strowman on the outside, setting up a monstrous Triple Powerbomb through the announce table. Clearly, the message of Reigns’ bout with Bálor was that Raw does, indeed, have a fighting champion. The message of what happened after is that Braun Strowman isn’t the only one with an ace in the hole. Drew McIntyre promised to wipe the smile off Finn Bálor’s face, but the first-ever Universal Champion was still flashing those pearly whites at the end of the night, having defeated The Scottish Terminator not once but twice. Granted, the first was more of a moral victory than anything, as Dolph Ziggler interfered at a crucial moment to instigate a two-on-one beatdown that resulted in a disqualification and left The Extraordinary Man in a heap. When Seth Rollins arrived to even the odds, Raw General Manager Kurt Angle restarted the bout as a tag team contest, and Finn & Seth pulled out the win there as well, with The Kingslayer scoring the fall by tossing McIntyre from the ring and administering a Stomp to Ziggler. And, off the strength of that victory, Rollins received another crack at the Intercontinental Title, as Angle sanctioned Ziggler vs. Rollins for SummerSlam. Smiles all around, and who can blame them? The Miz’s quest to claim his ninth Intercontinental Championship ended at WWE Backlash when Raw’s Seth Rollins defeated The A-Lister to retain the title, thus sending Miz back to SmackDown LIVE without his signature prize. That’s a bitter pill to swallow for Miz, who has essentially hitched his identity to the Intercontinental Title over the last two years. In fact, he’s weeks shy of the all-time cumulative record reign, and a victory here would have tied him with Chris Jericho at nine stints as champion. With history at stake, Miz brought a near-perfect game plan to WWE Backlash, but Rollins — who christened himself as a “fighting champion” this past week on Raw in an effort to distance himself from Universal Champion Brock Lesnar — fought with all his heart to finally earn the checkmate. Miz had taken an L before the match even began, as The Miztourage declined to rejoin their former leading man at ringside. Miz still rose to the occasion at first, countering everything Rollins threw at him and rolling outside the ring to slow the match down each time The Architect began to heat up. The A-Lister’s excellent game plan forced Rollins to go high-risk, and while one maneuver — a picture-perfect Frog Splash from the rafters — hit its mark, The Architect’s attempt at a Revolution Knee on the apron did not, and he smashed his knee full-bore into the ring post. Miz seized his moment and wrenched Rollins into the Figure-Four Leg-lock, but Rollins showed his heart, which made the difference as the match entered its final stretch. The Kingslayer not only powered his way out of the Figure-Four, but he kicked out of a pair of Skull-Crushing Finales (one of which came after Miz dead-lifted Rollins into position), and in the match’s deciding moment, Rollins used a half-second window in between dueling roll-up attempts to stomp Miz into the mat for the victory. So, Miz heads back to SmackDown empty-handed but impressive in defeat. Rollins returns to Raw with championship in hand, a line of challengers at his doorstep, and ready to fight the good fight. Still amped from his epic Intercontinental Title defense against Samoa Joe last week, Roman Reigns came into Memphis looking to expand his Roman Empire. Little did he know, he stepped into a good brother town. To be fair, it wasn’t exactly The Big Dog’s boasting or his proclamation that “if you mess with one of the members of The Shield, you mess with all of us” that raised the collective ire of Finn Bálor, Luke Gallows & Karl Anderson, the reunited running mates now calling themselves The Bálor Club. That fault lies with Jason Jordan, whose Raw Tag Team Title win with Seth Rollins led the young Superstar to get a little too familiar with Reigns and Rollins. Jordan’s boast that he, Reigns and The Kingslayer (disappointed, for what it’s worth, at his partner’s lack of “timing”) might be nothing less than “the most dominant three-man group in WWE” was what brought The Bálor Club out in earnest, leading to a confrontation that boiled over when the good brothers insinuated that Jordan was a nerd. Jordan responded with a slap to the face of Gallows, and Raw General Manager Kurt Angle provided the solution, sanctioning a Six-Man Tag Team Match between the two groups for later in the night. 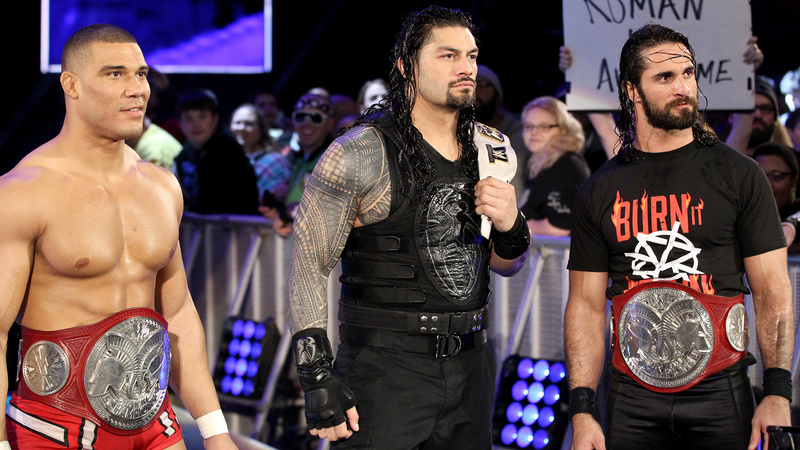 In a match spawned from the question of whether The Bálor Club or the so-called “Champions Club” was the most dominant three-man team in WWE, the good brothers landed a deafening salvo when they knocked off the gold-plated trio of Roman Reigns, Seth Rollins & Jason Jordan, who were shown up again when another three-man squad came calling after the bout. As for the epic Six-Man Tag Team Match, The Bálor Club brawled to the victory by working seamlessly as a group; one was never far from the other, so even when Finn found himself pummeled by Reigns, his partners were there to distract The Big Dog and tilt the match back in their favor. The “Champions Club,” on the other hand, seemed a step out of sync, and an overzealous Jordan rushed the ring and blinded the ref to a key tag from Rollins to Reigns (there’s that timing issue again). The Kingslayer was left as easy pickings for a bone-rattling Magic Killer, and while Reigns dispatched Luke Gallows & Karl Anderson singlehandedly outside the ring (taking himself out of action in the process), Finn Bálor seized control, tossing Jordan from the ring and spiking the wounded Rollins with a missile dropkick and chest-caving Coup de Grâce for the win. The night only got worse for the title-toting trio, as The Miz & The Miztourage struck while they argued among themselves, dispatching the Raw Tag Team Champions before wiping Reigns out with a Skull-Crushing Finale and, in the ultimate act of disrespect, a Triple Powerbomb. Consider the favor repaid and the message relayed.